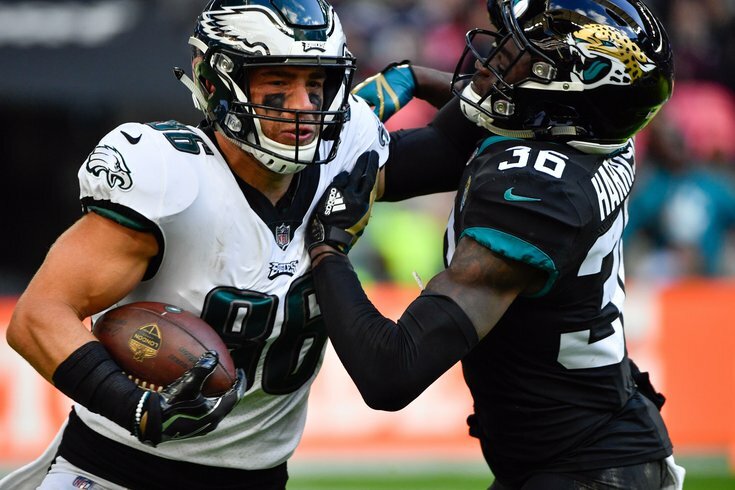 Philadelphia Eagles tight end Zach Ertz fights off Jacksonville Jaguars defensive back Ronnie Harrison during the first half at Wembley Stadium. On Sunday, bright and early at 9:30 a.m. EST (1:30 p.m. local time), the Philadelphia Eagles will take on the Jacksonville Jaguars in a potential season-saving matchup for both teams. One of the rare teams in the NFL that even come close to matching the Eagles' injury woes this season is the Jags, who will be without quite a few starters, including their lead running back, their starting LT, their top two tight ends, and three of their top four cornerbacks. You can find the final Eagles-Jaguars injury report with analysis here. As we noted in our five matchups to watch, the Jaguars would ideally love to run the football, but have been unable to commit to it this season after falling behind in many of their games. The Eagles must not allow Jacksonville to get into their comfort zone. When the Eagles have the ball, they could be in a good position to exploit the Jags' depleted secondary, but Jason Peters and Lane Johnson will have their hands full with Jacksonville's talented edge rushers. Despite Doug Pederson's insistence that nobody is giving the Eagles any chance of winning their games, the Eagles have been favored in every game so far, including this one, by three points. Here are our staff writer picks, as well as who other publications are picking.